I have never been one to set resolutions in January because… well… we all know how that goes. BUT it just so happens that the end of this year 2012 (fortunately, not the end of the world) is the time when I decided it is TIME FOR A CHANGE! Being that I am now 42 (and look nothing like the avatar you see on this blog which was a cartoon based on a photo taken of me 4+ years ago) I decided it was time for a BIG change. 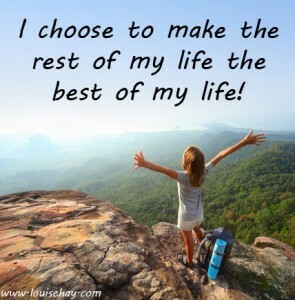 Make the rest of my life the best of my life! Yep, I am going to join Crossfit. Let me give you a little background on what a BIG deal this is for me. First of all, I do not like exercising! I am “skinny fat” (term I learned from Jeena Cho). When it comes to exercise, I am lazy. Truthfully, I would much rather stay home and blog or watch an episode of Glee. However, my vanity and my desire to have more energy in my 40s is now overriding my laziness. Also, I’m at a point where I know I need to do something drastic, something big, because I know whenever I do something outside of my comfort zone or something that scares me, something better always happens. Why Crossfit? Well the answer is simple: I want to look like Tamara Holland and my neighbor Kat and they both do Crossfit. I told you, vanity was one of my driving forces. Oh and there is a Crossfit gym just down the street from my house which goes along with number 1, no more commuting to San Francisco. So, by February I will be starting my Crossfit training. I am committed to trying it for 1 month and will see how it goes after that. Are you wondering why I am telling you this? The reason is, if I put it in writing and send it out to the world to read I am much more likely to actually do it! Do you have any big plans for change? Based on your previous bolg re: random acts of kindness, I am considering 365 random acts of kindness in memory of Sandy Hook AND to keep me focused on OTHER rather than ME!! Don’t look for me boasting about this on fb as that would defeat the purpose. I think I’ll keep a private journal and figure out another way to share the experience as the year progresses….thanks for your inspiration!! I really like your Eleanor Roosevelt quote at the end there. It does sum up your intentions well, but it also marks much of what I have been going through lately. I find that I am pushing the envelop of my life quite a bit as well lately. Great post! I have some things on my list. They are in the development stages, should be final by New Year’s. Holy crap! I cannot tell you how honored I am to be here in this post, my dear Ms. Sally. You are way too kind. If I look strong, it is indeed because of CrossFit. I hope you will have a blast with it. Mostly, thank YOU for being an inspiration of kindness, the best-kind-of-social-media-wonderfulness, energy and goodness for all of us. I plan to focus on the good. A friend shared an idea on FB that I plan to implement tomorrow. I have a jar (with a lid) a pen and a stack of note paper. Whenever something good happens I plan to jot it down on a piece of paper and put it in the jar. On New Year’s Day (2014) I plan to sit down with the jar and reflect on all the good that happened in 2013. I “never” make New Year’s resolutions, but I think this is a good exercise in focusing on the good in my life and the world around me. Cheers!